To review the 10K course and elevation profile in MapMyRun click here. The West Quoddy 10K is a point-to-point route from the West Quoddy Head Lighthouse to the downtown Lubec waterfront. 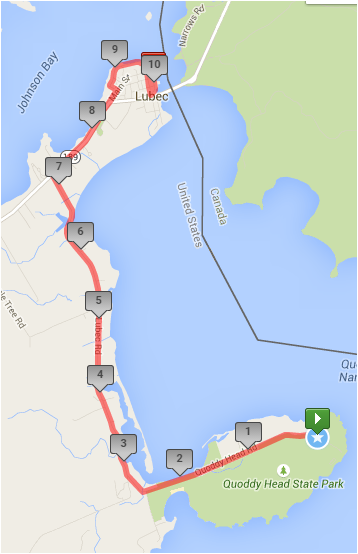 The 10K course is entirely within the USA and at no point do 10K runners cross into Canada. The course has a downhill start and is mainly flat and smooth until the last mile where there is a gentle up and downhill to reach a short, sharp hill about 200 metres before a very sharp turn into the 200-metre finishing stretch on Water Street in Lubec. On-course markers will be in 1-mile and 5-km increments. There will be shuttle buses from the school to the start as there is no private vehicular access to West Quoddy Head Lighthouse on race morning. Most parking is less than half a mile from the finish line, but there will be shuttle buses at the end of the race too. Runners may check one small soft bag at the starting area to be transported to Lubec for retrieval near the finish line.